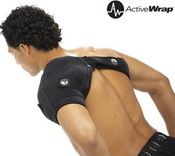 Shoulder Ice and Heat Compression Wrap all-in-one! This is a complete recovery shoulder and Knee therapy solution. This is a complete shoulder therapy solution. It's a shoulder ice wrap and a shoulder heat wrap all-in-one! Designed for injury specific adjustability and full freedom of movement during usage. Total comfort for any size shoulder, big or small. Just slip it on and start treating! 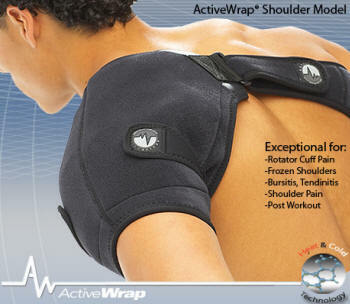 The ActiveWrap® shoulder system is the nicest fitting shoulder ice wrap on the market! Unique rotator cuff strap design drives the cold to where you need it. This is a must have for rotator cuff injuries and any shoulder dependent or throwing athlete! The ergonomically designed shoulder heat and ice wrap delivers lightweight conforming hot or cold therapy to all areas of the shoulder. Every wrap is outfitted with two pockets that hold our uniquely formulated heat and ice packs. Use one pack at a time or cover your entire shoulder complex after your next workout with both! Full one year warranty. Washable and latex free. 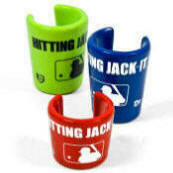 Hitting Jack-it is a complete hitting training system with patent pending design. The product comes in four sizes to assist progressive training. The 9oz size develops bat speed and works fast twitch muscles. The 12oz size strengths hands and forearms, and improves muscle memory. The 16oz size develops power and the 21oz “on deck” size builds Big League power. The first and only weighted system on the market that can be used to hit “live” (with a pitcher) batting practice, the Hitting Jack-It System comes in four sizes to assist progressive training. This knee ice wrap and knee heat wrap combination treats all aspects of the leg. It truly is an all-in-one therapy solution. 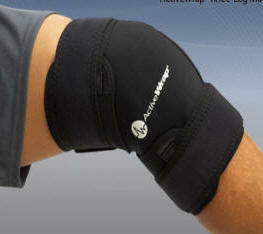 The ActiveWrap® knee system includes two large reusable heat and ice packs and a durable plush-prene™ compress wrap. The support is equipped with generous 3" wide plush compression straps that can be spiraled around the support to provide focused compression and easy fastening. This is not your typical drugstore ice pack for the knee. Unlike patches and other one time use pain relief products, ActiveWrap® is built for years of use. The ActiveWrap Knee Ice Wrap/Knee Heat Wrap is the absolute finest therapy wrap on the market today.